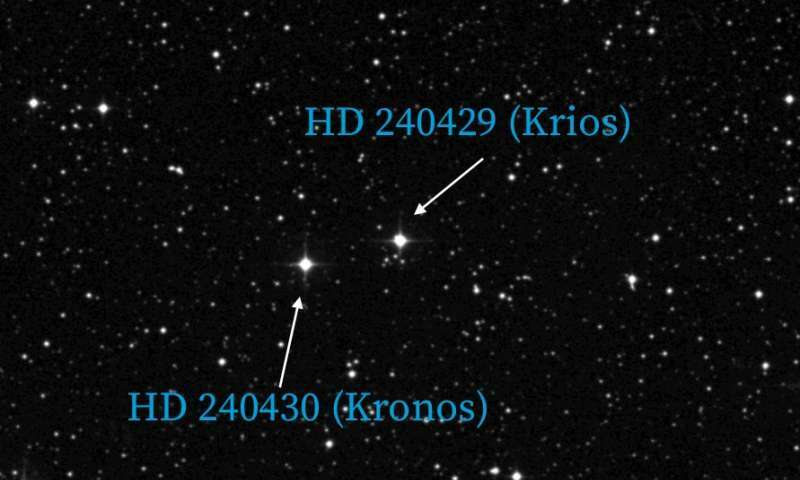 So when a group of Princeton astronomers discovered twin stars, one of which showed signs of having ingested a dozen or more rocky planets, they named them after Kronos and his lesser-known brother Krios. Their official designations are HD 240430 and HD 240429, and they are both about 350 light years from Earth. The keys to the discovery were first confirming that the widely separated pair are in fact a binary pair, and secondly observing Kronos' strikingly unusual chemical abundance pattern, explained Semyeong Oh, a graduate student in astrophysical sciences who is lead author on a new paper describing Kronos and Krios. Oh works with David Spergel, the Charles A. Young Professor of Astronomy on the Class of 1897 Foundation and director of the Flatiron Institute's Center for Computational Astrophysics. Other co-moving star pairs have had different chemistries, Oh explained, but none as dramatic as Kronos and Krios. Most stars that are as metal-rich as Kronos "have all the other elements enhanced at a similar level," she said, "whereas Kronos has volatile elements suppressed, which makes it really weird in the general context of stellar abundance patterns." In other words, Kronos had an unusually high level of rock-forming minerals, including magnesium, aluminum, silicon, iron, chromium and yttrium, without an equally high level of volatile compounds—those that are most often found in gas form, like oxygen, carbon, nitrogen and potassium. Kronos is already outside the galactic norm, said Oh, and in addition, "because it has a stellar companion to compare it to, it makes the case a little stronger." Kronos and Krios are far enough apart that some astronomers have questioned whether the two were in fact a binary pair. Both are about 4 billion years old, and like our own, slightly older sun, both are yellow G-type stars. They orbit each other infrequently, on the order of every 10,000 years or so. An earlier researcher, Jean-Louis Halbwachs of the Observatoire Astronomique of Strasbourg, had identified them as co-moving—moving together—in his 1986 survey, but Oh independently identified them as co-moving based on two-dimensional astrometric information from the European Space Agency's Gaia mission. During a group research discussion at the Flatiron Institute, a colleague suggested pooling their data sets. John Brewer, a postdoctoral researcher from Yale University visiting at Columbia University, had been using data from the Keck Observatory on Mauna Kea, Hawaii, to calculate the spectrographic chemistries and radial velocities of stars. "John suggested that maybe we should cross-match my co-moving catalogue with his chemical-abundance catalogue, because it's interesting to ask whether they have the same compositions," Oh said. Binary stars should have matching radial velocities, but that information hadn't been available in the Gaia dataset, so seeing their matching velocities in Brewer's data supported the theory that Kronos and Krios, though two light years apart, were a binary set. Then the researchers noticed the extreme chemical differences between them. "I'm very easily excitable, so as soon as they had the same radial velocities and different chemistry, my mind already started racing," said Adrian Price-Whelan, a Lyman Spitzer, Jr. Postdoctoral Fellow in Astrophysical Sciences and a co-author on the paper. Oh took more convincing, both scientists recalled. "Semyeong is careful and was skeptical," said Price-Whelan, so her first step was to double-check all the data. Once simple error had been ruled out, they began entertaining various theories. Maybe Kronos and Krios had accreted their planetary disks at different times during stellar formation. That one can't be tested, said Price-Whelan, but it seems unlikely. Maybe they only started moving together more recently, after trading partners with another pair of binary stars, a process known as binary exchange. Oh ruled that out with "a simple calculation," she said. "She's very modest," Price-Whelan noted. Oh's skepticism was finally overcome when she plotted the chemical abundance pattern as a function of condensation temperature—the temperatures at which volatiles condense into solids. Condensation temperatures play a key role in planetary formation because rocky planets tend to form where it's warm—closer to a star—while gas giants form more easily in the colder regions far from their star. She immediately observed that all of the minerals that solidify below 1200 Kelvin were the ones Kronos was low in, while all the minerals that solidify at warmer temperatures were abundant. "Other processes that change the abundance of elements generically throughout the galaxy don't give you a trend like that," said Price-Whelan. "They would selectively enhance certain elements, and it would appear random if you plotted it versus condensation temperatures. The fact that there's a trend there hinted towards something related to planet formation rather than galactic chemical evolution." That was her "Aha!" moment, Oh said. "All of the elements that would make up a rocky planet are exactly the elements that are enhanced on Kronos, and the volatile elements are not enhanced, so that provides a strong argument for a planet engulfment scenario, instead of something else." Oh and her colleagues calculated that gaining this many rock-forming minerals without many volatiles would require engulfing roughly 15 Earth-mass planets. Eating a gas giant wouldn't give the same result, Price-Whelan explained. Jupiter, for example, has an inner rocky core that could easily have 15 Earth masses of rocky material, but "if you were to take Jupiter and throw it into a star, Jupiter also has this huge gaseous envelope, so you'd also enhance carbon, nitrogen—the volatiles that Semyeong mentioned," he said. "To flip it around, you have to throw in a bunch of smaller planets." 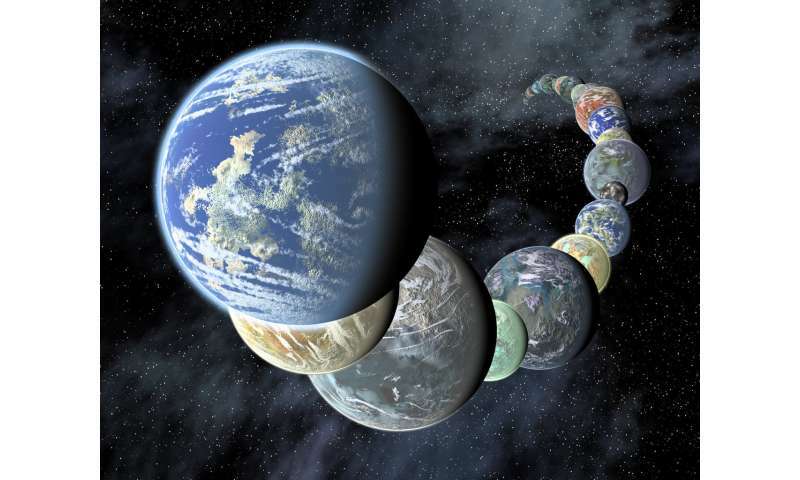 While no known star has 15 Earth-sized planets in orbit around it, the Kepler space telescope has detected many multi-planet systems, said Jessie Christiansen, an astronomer at the NASA Exoplanet Science Institute at the California Institute of Technology, who was not involved in the research. "I see no problem with there being more than 15 Earth masses of accretable material around a solar-type star." She pointed to Kepler-11, which has more than 22 Earth masses of material in six planets with close orbits, or HD 219134, which has at least 15 Earth masses of material in its inner four planets. "At the moment, we are still at the stage of piecing together different observations to determine how and when exoplanets form," said Christiansen. "It's difficult to directly observe planet formation around young stars—they are typically shrouded in dust, and the stars themselves are very active, which makes it hard to disentangle any signals from the planets. So we have to infer what we can from the limited information we have. If borne out, this new window onto the masses and compositions of the material in the early stages of planetary systems may provide crucial constraints for planet formation theories." The research also has implication for stellar formation models, noted Price-Whelan. "One of the common assumptions—well-motivated, but it is an assumption—that's pervasive through galactic astronomy right now is that stars are born with [chemical] abundances, and they then keep those abundances," he said. "This is an indication that, at least in some cases, that is catastrophically false."